CFS Ltd offers over 24 years experience in filtration and bag filters provide a cost effective solution to many filtration requirements. The filter bag filter has come a long way since its inception and is now available in a wide range of medias including Polypropylene, Polyester, Nomex and PTFE. Fully welded bags ensure that the liquid passes through the filter media and not through the holes formed in stitching. A needle hole can be as large as 1200 microns, not good if you want fine filtration! The picture above illustrates the problem well. It should be remembered fluids will take the path of least resistance and a needle hole is that path. Stitched filters can have their place but for fine filtration welded bags are the best option. Bag selection is important depending on the liquid being filtered, the flow rate, if the bag is being combination with finer cartridge filtration and the temperature at which filtration will occur. CFS can offer advice on all of these aspects. CFS can offer filter bags to fit almost any existing bag housing. We can also offer standard bags and extended life bags to suit particular applications. The standard bags sizes are shown in the picture and include size 1, 2, 3 and 4, however CFS can offer filter bags to suit many other filter housings and our rang includes sizes 5 through to 9. 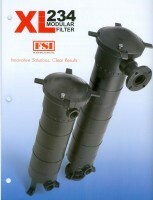 We can provide filter bags to suit housings made by a wide range of companies including Amazon, Eaton, GAF etc. as well as provide our own high quality bag housings in polished stainless steel or Polypropylene. Bag Filters are available in Micron ratings from 1 micron to 1500 micron. Bag filters are generally nominally rated so if finer absolute filtration is required a combination of bag filters and absolute rated beta 5000 rated cartridge filters may be required. CFS can support all of these requirements and can provide laboratory testing to ensure the correct combination is selected. Surface Area: 0.19 Mtr. sq. 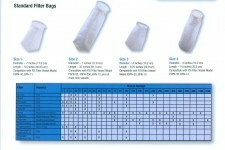 Max recommended flow rate per bag. 190 lpm for 1 micron 280 lpm for 200 micron felt. Surface Area: 0.41 Mtr. sq. Max recommended flow rate per bag. 340 lpm for 1 micron 600 lpm for 200 micron felt. Surface Area: 0.05 Mtr. sq. Max recommended flow rate per bag. 10 lpm for 1 micron 80 lpm for 200 micron felt. Surface Area: 0.09 Mtr. sq. CFS can offer a wide range of advice and guidance if required. CFS has the backing of FSI a world leader and one of the instigators of bag filtration. With manufacturing and representation worldwide your company can use the same filters in the UK, America, across Europe or even in China. CFS can provide a unique product in a housing which will accept both filter bags and filter cartridges and is 100% glass filled polypropylene for excellent strength and chemical compatibility. For those who want a non corrosive bag housing this fits the bill, and for those who want a polypropylene cartridge housing which will not rust again this is ideal. Rated up to 85 psi this housing is suitable for most applications and the new EZloc lid release makes removal quick and easy. Please contact CFS for full details and guidance.